A sequence of steadily-smaller circles is placed within the drawing, such that each new circle goes into one of the interstitial places between previous circles. Numbers have a certain fascination for me, so this had to happen. 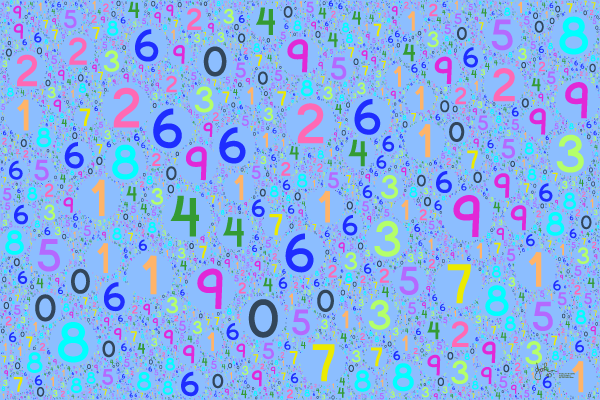 All the digits are strewn at random over fractal space, each with a unique color. The interested viewer, by looking closely, can surely find a pattern hidden in here that will be the winning Lotto ticket next month. Blue background, because numbers give people the blues in so many cases. The impression is that of an infinitude of ever-shrinking pebbles. The original has about 16000 circles, all fully resolved. This image has been compressed for internet use and the resolution is much less.